The Federal Reserve has been trying to raise inflation for eight years with, so far, muted results. 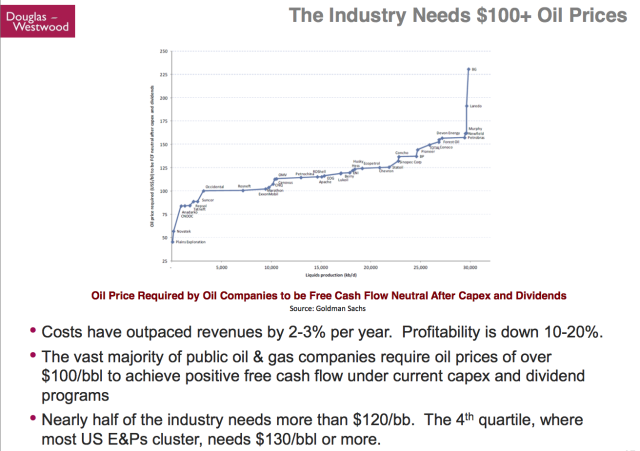 But some analysts think we’re at an inflection point and pricing pressures will continue to strengthen. The Treasury market’s implied inflation estimate seems to agree, supported by moderately firmer numbers in the official inflation statistics. We’ve heard this forecast before, of course. But forecasts of higher inflation in the years since the 2008 financial crisis have come to naught as disinflationary forces held firm in the wake of the Great Recession. Is that about to change? There’s still a compelling case for thinking that the renewed forecasts for higher inflation will again fall flat. In a world where demand is still weak and the appetite for safe havens strong, the argument that inflation is set to break higher tends to fall on deaf ears. But the Treasury market appears to be pricing in the possibility that moderately higher inflation in the near term is no longer a low-probability event. The implied inflation forecast via the yield spread for the nominal 10-year Note less its inflation-indexed counterpart climbed to a six-month high of 1.71% yesterday (Oct. 26), based on daily data from Treasury.gov. That’s still a low rate relative to the last several years, but the upward bias since the summer is conspicuous. The market’s modest repricing of inflation expectations could be noise, but Martin Hegarty, head of inflation-linked bond portfolios at BlackRock, thinks there’s a deeper transition underway that’s driving the crowd’s attitude adjustment. “The underlying fundamentals for inflation are better than they’ve been for a long time,” he told the FT last week. Stephen Stanley, chief economist at Amherst Pierpont Securities, advises that the Fed is inclined to agree. “The rising tide of inflation is the main reason that I believe the [Fed] will actually follow through and raise rates in December, even as it has lost its nerve a handful of times over the past 18 months,” he told clients in a research brief published last Friday. 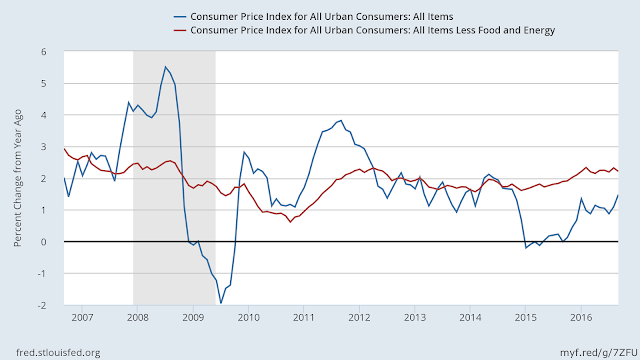 Official inflation numbers suggest as much, based on the relatively elevated year-over-year gains for core consumer inflation (prices excluding food and energy via red line in chart below) vs. headline inflation (blue line). 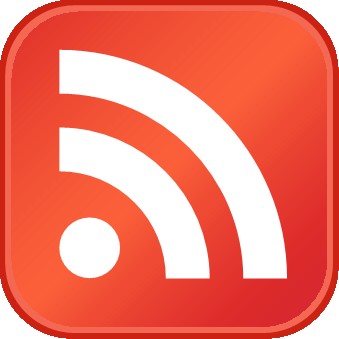 Economists are fond of pointing out that core inflation is a more reliable estimate of the trend, which implies that the comparatively low pace in the headline rate will rise in the months ahead. If inflation is headed higher, what does that imply for the stock market? For much of the past eight years, higher inflation expectations have coincided with higher equity prices. 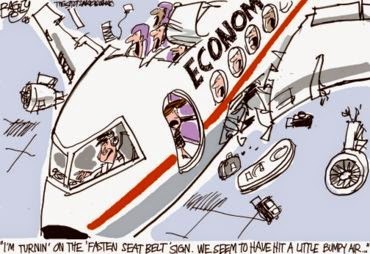 The reasoning is that firmer pricing is a sign that the economy is strengthening. The tight correlation made sense as long as deflation fears continued to stalk the economic landscape. The question is whether the tight positive correlation between the S&P 500 and Treasury market inflation expectations in the post-2008 era will roll on if pricing pressures are due to trend higher? The relationship between the two markets hit some turbulence in recent months when the S&P 500 shot higher in the summer while the implied inflation estimate via the 10-year yield spread drifted lower. 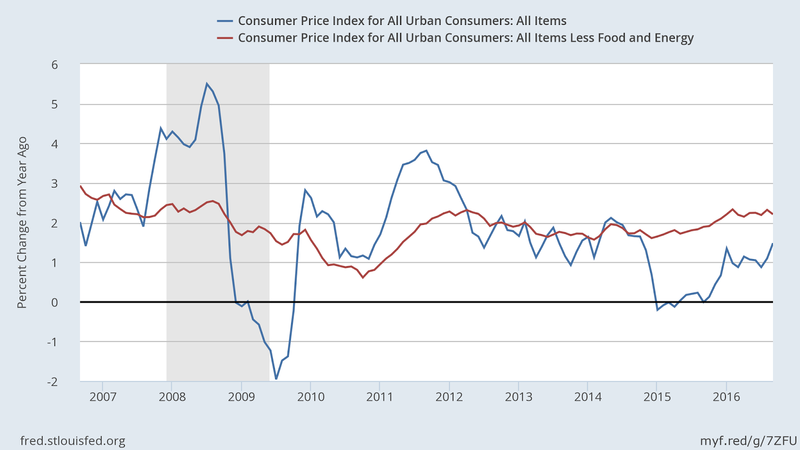 But the gap has recently closed as the crowd’s inflation forecast has firmed. The stock market, meanwhile, has been flatlining lately. 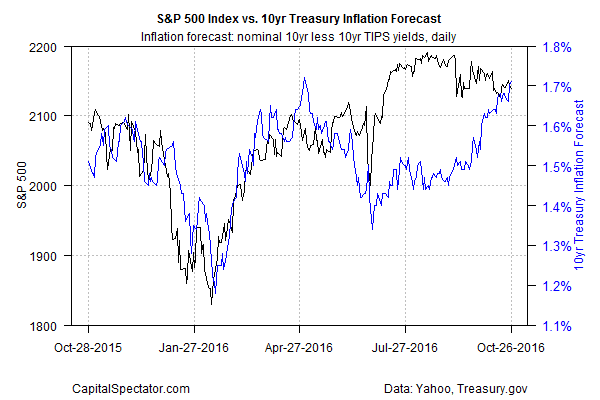 Is this a sign that higher inflation from here on out is no longer a bullish factor for stocks? Treasury 10-year yields have risen about 22 basis points to 1.82 percent in October as investors prepared for the Federal Reserve to raise interest rates. It’s the biggest monthly increase since June 2015. The median forecast among the economists surveyed by Bloomberg is for 1.75 percent by Dec. 31, suggesting the selloff has gone too far. But analysts who are expecting that yields have hit a ceiling may be singing a different tune if the next round of economic releases delivers upside surprises. In particular, keep an eye on next week’s September update on personal income and spending, followed by the payrolls data for October. While we’re waiting, tomorrow’s preliminary GDP report for the third quarter will set the tone for expectations. The crowd’s looking for a solid acceleration in growth to 3%, according to CNBC—the fastest rise in two years and up sharply from Q2’s 1.4% advance. 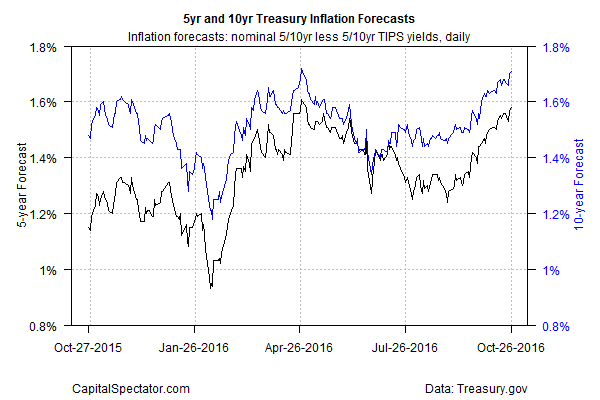 If the prediction is right, the outlook for higher inflation may be headed for yet another upgrade.